Because emotions enhance memory processes and music evokes strong emotions, music could be involved in forming memories, either about pieces of music or about episodes and information associated with particular music. A recent study in BMC Neuroscience has given new insights into the role of emotion in musical memory. Music has a prominent role in the everyday life of many people. Whether it is for recreation, distraction or mood enhancement, a lot of people listen to music from early in the morning until late at night, especially since the invention of radio and recordings. Because of its near ubiquity, music has been identified as important in the construction of autobiographical memories and thus for making judgments about oneself and others. But which musical pieces do we remember, and how is music related to our memory? This interesting question has as yet received surprisingly little attention in the scientific literature. Several papers [1–5] have looked at the role of music in memory formation and recall of autobiographical and episodic information, and a recent paper in BMC Neuroscience in particular gives new insights into the role of emotion in musical memory . Collectively, these papers emphasize the enhancing role of music and emotion on memories in various contexts, which I shall focus on in this review. Musical sounds, like all auditory signals, unfold over time. It is therefore necessary for the auditory system to integrate the sequentially ordered sounds into a coherent musical perception. This series-to-parallel transformation can be considered a mechanism of working memory, which temporarily stores auditory units and combines them into a single percept (such as a sound pattern, rhythm or melody). Interestingly, there seems to be a high degree of overlap between working memory for musical stimuli and for verbal stimuli, as has been shown in recent working-memory experiments . This might be one of the reasons why musicians tend to show a slightly superior verbal working memory – at least in tonal languages such as Chinese [8, 9]. Recently, Sluming et al. found that in musicians, compared with non-musicians, there is more gray matter in the part of the frontal cortex known to accommodate neural networks that are involved in several important working memory processes. One might thus conclude that a kind of positive transfer between musical performance and verbal memory functions takes place; in other words, that the process of learning music improves the learning of verbal tasks (see Box 1 for definitions of technical terms used in this article). Although hearing music is closely associated with strong emotional feelings, and although music activates the entire limbic system, which is involved in processing of emotions and in controlling memory [11–14], most studies examining musical memory have not focused on the role of emotion in this form of memory. In the foreground of these studies have been questions such as: Is there a difference between implicit (unconscious) and explicit (conscious) musical memory? Which surface parameters of music, such as timbre and tempo, are most relevant for efficiently transferring or encoding musical information into long-term memory and for retrieving it? Are the titles of musical pieces recalled better than melodies, for instrumental or for vocal music? For example, Halpern and Müllensiefen  manipulated timbre and tempo in order to examine their influence on implicit and explicit memory for tunes. After encoding 40 unfamiliar short tunes, participants were asked to give explicit and implicit memory ratings for a list of 80 tunes, which included 40 that had previously been heard. To measure implicit memory, a rating of the pleasantness of old and new melodies was used, whereas to measure explicit memory the researchers used the difference between the recognition confidence ratings of old and new melodies. Half of the 40 previously heard tunes differed in timbre or tempo in comparison with the first exposure. Change in timbre and tempo both impaired explicit memory, and change in tempo also made implicit tune recognition worse. 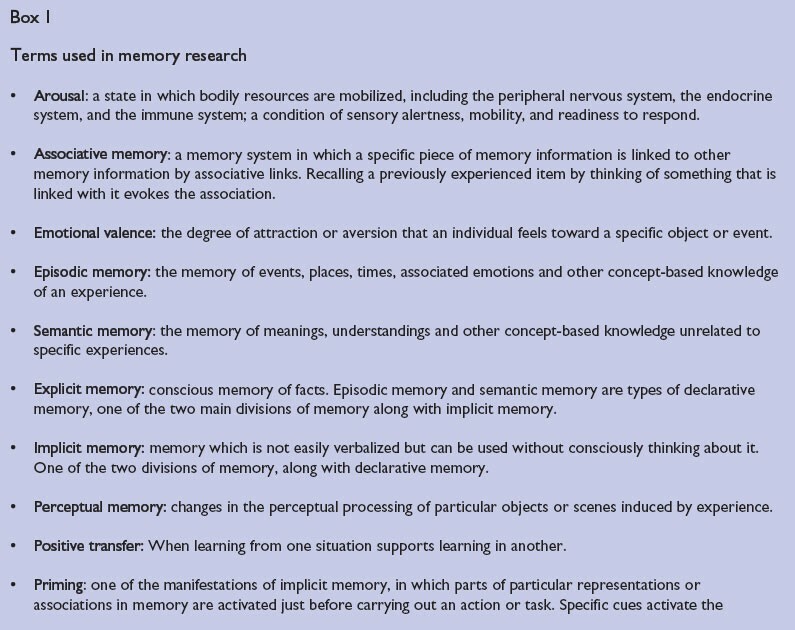 These findings support the hypothesis on which this experiment was based – that there are two different musical memory systems, one implicit and the other explicit . A similar distinction has been drawn by Samson and Peretz . On the basis of a comprehensive analysis of neurological patients suffering from lesions in either the right or the left temporal lobe, they concluded that right temporal lobe structures have a crucial role in the formation of melody representations that support priming and memory recognition, which are both more implicit memory processes, whereas left-sided temporal lobe structures are more involved in the explicit retrieval of melodies. Other studies have focused on one particular aspect of musical memory, memory for musical pitch. These studies were motivated by investigations into absolute pitch (or perfect pitch), the rare ability of some people to identify or sing a musical note without relating it to a previously played note. Many researchers believe that absolute pitch is a specific kind of musical memory. However, Levitin  found that it was more common than previously assumed. He asked a large sample of subjects who did not have absolute pitch to sing popular songs and compared the produced pitch with the actual pitches used in the recordings of these songs . Approximately 50% of the subjects sang the song in the correct pitch, at least in one or two experimental sessions. Forty-four percent were not perfect in producing the correct pitch but they were within two semitones of it. Thus, this study shows that even non-musicians might have relatively stable representations of pitch . Pitch memory can be improved in non-musicians by pitch memory training and can even be enhanced by applying electrical stimulation to the left supramarginal gyrus [16, 17]. Although these studies have told us some important things about pitch memory, only a few have focused on memory for longer musical pieces. Autobiographical information associated with musical melodies is evoked when we hear relevant music or when we are engaged in conversation about music or episodes and events in our life in which music has been important. Hearing music associated with our past often evokes a strong 'feeling of knowing'. We have this feeling for many songs without knowing the title or text of the songs. We are, however, better at recalling the titles of the tunes we listen to (when the tunes are instrumental) than at remembering a melody by simply reading or hearing its title. The opposite pattern occurs when remembering vocals, for which the titles of the songs are much better cues than the melodies . The finding of this link between text and music, which suggests that music is encoded in semantic memory like text, is of particular importance. Many researchers believe that music is encoded in the brain by the perceptual memory system, which organizes auditory information into melodies and rhythms, rather than by the semantic memory system, which encodes meaning. Nevertheless, musical information could be associated with emotional and semantic information (associative memory), either indirectly or directly, as was shown , even if it is not directly related to semantic information. A more recent paper by Stefan Koelsch and colleagues  has elegantly shown that short musical pieces with particular characteristics can prime the semantic language memory system, thereby yielding faster and more efficient recognition of specific words. The general principle of their experiment  was to present target words that were preceded by either musical or sentence primes. Electrical brain responses to the target words (the N400 event-related potential, a dip in scalp electrical activity that occurs 400 milliseconds after the target word) were measured. When the musical piece was semantically related to the target word, the brain response to the target word was reduced (representing less neural activation associated with the search in semantic memory), whereas when the musical piece was unrelated to the target word, the response was enhanced. A typical musical prime for the target word 'needle' was a passage of Schönberg's String Terzett, which was written to describe musically the 'stitching' pains during the composer's heart attack. Other musical primes had been chosen on the basis of their musicological terminology; for example, the prime for the word 'narrowness' was an excerpt in which close intervals dominate. Others were chosen because they resembled the sounds of objects (such as birds) or qualities of objects (such as low tones associated with a basement, or ascending steps in pitch with a staircase) . Taken together, these two experiments [3, 18] demonstrate that there are bidirectional associations between the memory systems for language and melody. A specific feature of the perceptually based music memory system is that the stored information is relatively abstract (compared with that in semantic memory), allowing recognition despite changes in instrumentation, loudness, tempo or register. Lesion studies and recent brain imaging studies [19–21] have shown that this perceptual memory system is located bilaterally in the auditory cortex (including the supramarginal gyrus). In addition, the inferior frontal and inferior temporal brain areas have been shown to be important in recognizing familiar tunes. To determine where other kinds of musical memory are stored in the brain, however, a distinction needs to be made between an episodic and a semantic musical memory system. Episodic memory for musical information is defined by Platel and colleagues  as "the capacity to recognize a musical excerpt (whether familiar or not) for which the spatiotemporal context surrounding its former encounter (i.e., when, where, and how) can be recalled". Semantic memory allows us to identify familiar songs or melodies by naming the tune or by humming or whistling the subsequent notes of a melody. It is thought that musical semantic memory may represent a musical lexicon, which is different from a verbal lexicon, even though there are certainly strong links between them (see above). On the basis of a high-resolution positron emission tomography study, Platel and colleagues  delineated different brain networks involved in processing semantic and episodic memory. For episodic musical memory they found increases in cerebral blood flow bilaterally in the middle and superior frontal gyrus region (with a left-sided preponderance) and the precuneus, whereas for semantic musical memory there was a blood flow increase bilaterally in the medial and the orbitofrontal cortex, the left angular gyrus, and the left anterior part of the middle temporal cortex. From these findings one can conclude that these two different musical memory systems have a different neural representation. It is interesting to note that these brain areas partly overlap with verbal semantic and episodic memory systems. Another recent study  examined the memories and emotions that are often evoked when hearing musical pieces from one's past. In this experiment, subjects were presented with a large set of short musical excerpts (not longer than 30 seconds per excerpt) of past popular songs. Using a set of newly designed questionnaires, the authors found that, on average, 30% of the presented songs evoked autobiographical memories. In addition, most of the songs also evoked various strong emotions, which were mainly positive ones such as nostalgia. These results are consistent with the broader literature (reviewed in ) in which enhanced recall is observed for both positively valenced (intrinsically pleasant) and arousing (stimulating) events. Thus, positive emotions and high arousal levels that are associated with specific events act as a memory enhancer for these particular events. In the context of associative memory models, this memory-enhancing effect of emotions and arousal can be explained as a strengthening of the associations between the memories due to strong emotions and to arousal. Until recently however, no study has explicitly examined whether emotional valence or arousal are correlated with musical memory. In a recent paper published in BMC Neuroscience, Eschrich and colleagues  investigate whether musical pieces that induce high arousal and very positive valence are remembered better by non-musicians than unarousing and emotionally neutral musical pieces. To examine these questions the authors designed a behavioral memory experiment composed of two sessions. In the first session (the encoding phase) the subjects were exposed to 40 musical pieces, each lasting 20–30 seconds. One week later, in the recognition phase, participants listened to the 40 old musical excerpts randomly interspersed with 40 new excerpts and were asked to make a decision about whether each one was old or new, and to indicate the arousal level and emotional valence of the pieces. The musical stimuli were selected from a larger data pool by musically trained raters and comprised symphonic film music by various composers. From the old/new decisions of the participating subjects, the researchers calculated recognition scores and demonstrated that musical pieces that were rated as very positive were recognized significantly better than those rated as less positive. Arousal ratings were not predictive for recognition performance, meaning that only emotional valence is related to musical memory . A further part of this experiment  was designed to assess whether different psychological conditions present during the encoding phase might have an influence on musical memory performance. For this, the authors divided the subject sample into two groups: one required to judge valence during encoding (the emotion group) and the other required to estimate the length and general loudness of each musical stimulus (the time-estimation group). The two groups did not differ in their recognition scores. It is interesting that the time-estimation group, despite not concentrating on the emotions during the first encoding session, showed the same recognition performance as the emotion group. This shows that emotion is automatically evoked by the musical pieces and inevitably influences recognition, even when it is not focused on. In summary, the study by Eschrich and colleagues  is consistent with the rest of the literature on emotion as a memory enhancer. The novel aspect of this study, however, is the finding that musical memory is strongly related to the rated attractiveness and not to the experienced arousal of the musical piece. Thus, emotion enhances not only memories for verbal or pictorial material, as summarized by Buchanan , but also for musical pieces. This study  also provides additional support for a tremendous role of music in building our autobiographical memories. Emotional music we have heard at specific periods of our life is strongly linked to our autobiographical memory and thus is closely involved in forming our view about our own self. In this respect it is interesting to note that listening to music is not only accompanied by blood flow increases in brain areas known to be involved in generating and controlling emotions [12, 13], but it is also accompanied by a general increase and change of brain activation within a distributed network comprising many brain areas and the peripheral nervous system [11, 24–27]. Thus, listening to music (even when we listen passively) activates many psychological functions (emotion, memory, attention, imagery and so on) located in a distributed, overlapping brain network. If music has such a strong influence on emotions and our cognitive system, this raises the question of whether the memory-enhancing effect of emotional music can be used to enhance cognitive performance in general and in clinical settings. In a single-blind, randomized and controlled study, Särkämö et al. examined whether everyday music listening can facilitate the recovery of cognitive functions and mood after a stroke. The results of this study revealed that recovery of verbal memory and focused attention improved significantly in the group of patients who listened to their favorite music on a daily basis compared with the patients who listened to audio books or received no listening material (control group). Besides the improvement in cognitive functions, there was also a substantial mood improvement in the patients who listened to music (they were less depressed and less confused) compared with the control group. These studies and especially the study by Eschrich and colleagues  support the tremendous influence of music on our emotional and cognitive system. Music automatically awakes us, arouses us and engenders specific emotions in us, which in turn modulates and controls many cognitive functions.